A safe source of quick acting organic nitrogen which naturally produces more vigorous growth. A balanced general fertiliser supplying all three major NPK nutrients. A water soluble Sulphate of Ammonia containing 21% nitrogen and 24% sulphur. Gives a quick release of nitrogen. Flexible application rates to suit growth requirements. A high quality soluble version which can also be applied as a powder or as a liquid. Powdered potassium fertiliser which hardens plants. A fast acting source of potassium to help the development of healthy fruit and flowers. Buy Sportsmaster Renovator Pro 14:0:5 lawn weed feed and moss killer online here. 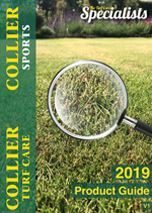 Sportsmaster Cleanrun Pro 14:0:5+Herb is ideal for use during spring and summer when broad leaved weeds are present and need controlling in one application. Greenmaster Pro-Lite Autumn 6:5:10+6Fe is the ideal first granular fertiliser application of the season or applied in autumn to harden turf. Sierrablen Plus Spring Starter 24:5:13 is the ideal first controlled granular fertiliser application of the season. This NPK high nitrogen sportsfield formulation is ideal for use during the late Spring and Summer period when the lawn is growing strongly.